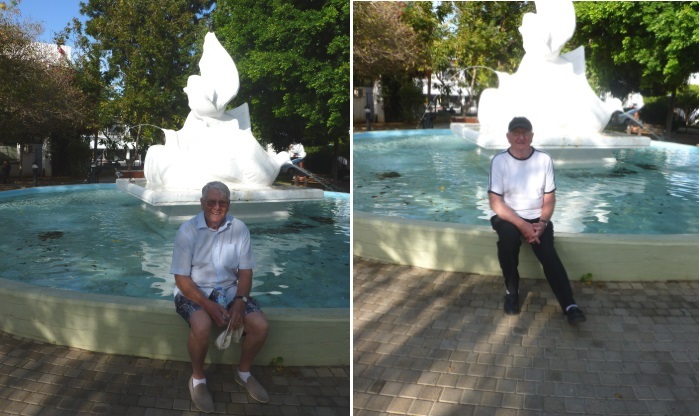 Part 1 – Terry and Derek’s holiday including the 2016 Remembrance Service in Kyrenia and a trip to Wayne’s Keep in the Buffer Zone. Our bags were packed and we were ready to set off on the first leg of our journey to Stansted Airport, Terry travelling by train from Denver, Downham Market and me travelling from Gt Blakenham, Ipswich. I was collected by Michael the owner of Claydon Executive Travel and he deposited me at the airport where I found a seat where I could watch out for Terry coming from the direction of the trains. Terry appeared with a big grin on his face and he greeted me and perched on the seat beside me where we agreed to sit while he caught his breath before we checked in. I am always nervous about my luggage being overweight, but I need not have worried, everything was fine for both of us. I was a bit more relaxed now going through security and I had no problem, although I spotted Terry being “frisked” by a man in uniform – no idea why! We made our way through Duty Free and purchased some goodies to eat and drink on the plane and at last sat down for a well-deserved coffee before making our way to Departures and the start of our 2-week holiday in Cyprus. After we had breakfast and unpacked, we walked to the Pia Bella, which for me was painful due to my knee which needs replacing and my toe that I crushed three days before the holiday. We looked around for friends and quickly found Harry Wyn Jones, John and Anne Rhind, Derek and Joyce Yeoman who we meet every year and then Pop Whitwell and Roger Handley appeared so we had a short chat after which we caught a taxi down to Kyrenia Harbour and slowly walked around taking in the sights and then almost reaching the Chimera Restaurant and Bar which we visit very often every year we saw two waiters we meet every year who immediately on seeing us came over and gave us a wonderful welcome. As we had time to spare we had a drink with the boys, then we decided to go up and have a look at the Castle and foolishly, with my leg and toe problem, we decided to go up and walk around the battlements which brought me a few moments of sadness because when my wife Shirley was ill she very often collapsed saying her knees gave up which I had a job understanding, but on that walk along the very uneven battlements my knees just gave away beneath me and so we sat down for ten minutes and slowly feeling in my legs returned so we found the easiest way down to the exit which was very close to the Chimera Restaurant where we had a cold drink before returning to the hotel. At this point I realised I had lost my camera, did I leave it in a restaurant or perhaps a taxi? Not a good start to the holiday for me. Margaret and Chris came to the hotel to welcome us and took us for a nice fish and chip supper at the Crispy Squid in Çatalköy. Huge portions accompanied by salad and bread and butter, it was very nice indeed. We then had a bit of a sightseeing tour around the town before being dropped off back at our hotel. On Saturday 12th November, we went to the Pia Bella to find Brian Thomas of the Royal British Legion, Kyrenia Branch where he was surrounded by the veterans who we join each year and we sorted payment for the coach trips to the Old British Cemetery on Sunday 13th and Wayne’s Keep, Nicosia on Monday 14th. After this was all sorted we joined Harry, John and Anne Rhind for lunch in Kyrenia. Terry knows his way round the busy shopping areas of Kyrenia so I followed him and saw more of it than I have seen before. In the evening we joined Harry and his friends at the Blue Rose Restaurant which is owned/run by Lynn and her business colleague who does all of the cooking, which was terrific. Their sign boasted the best Brandy Sour in Kyrenia and I can now confirm that the statement is very true. We got up early Sunday morning and made our way to the Pia Bella to catch the coach to take us to the Old British Cemetery for the Remembrance Service, we had a few funny looks from the local residents and then cheers from all the veterans waiting outside the hotel and before climbing aboard the coach we all stood together as a group and pictures were taken by the Pia Bella doorman. 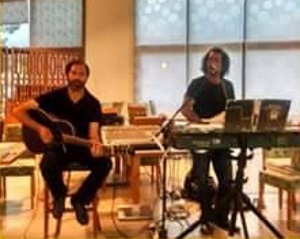 I am afraid I cannot establish who it was that took the photographs so unfortunately don’t have a copy. As always the ceremony at the Old British Cemetery was very poignant and I was very proud to be chosen to place the Suffolk Regiment Wreath on the memorial this year. The boys at the Chimera Restaurant are quite happy to let us sit at our table and watch the world go by and as they pass by taking meals to other customers they say “alright Terry, alright Derek” because the first day back we told them our names and each day when we appear they chant our names, the two in my photos have been there since my first holiday in 2012 and they now have a younger one helping them who has joined in the fun, the last day we were there we sat indoors as it was quite windy outside and the younger one was serving customers dressed in his duffle coat with the hood up. That evening we again went to the Blue Rose for a meal and I was by now sampling some of their meals I had never heard of before but they were delicious, Terry was eating meals unknown to me but they were what he had been enjoying when he comes on holiday with his wife Inez. This evening we were joined by two more couples, who were over for Remembrance Day, and Harry and the Rhinds so we now had quite a gathering and then a gentleman joined us and introduced himself as John Wynn Roberts, a Welshman that Harry soon started a conversation with and during the evening I finally managed to talk to him and he told me he knows Margaret and Chris and he wanted to know my link with them so I explained all about my memories which he was very interested in and I gave him a copy plus discs and he was a very happy man. The first night we visited the Blue Rose we met Lynn’s husband and he asked me why we were over in Cyprus and I explained to him the reason plus my friendship with Margaret and Chris and the conversation finished up with me also giving him a copy of my memories. The next day was an early breakfast because we had to be at the Pia Bella early for the Wayne’s Keep visit which was much the same as before, there were a few problems at the border from TRNC to the South then the UN vehicle which was to lead our coach driver to the Cemetery broke down so we had to sit in the coach whilst another vehicle was found. The UN personnel of the day had a large tent erected to one side where tables were situated with hot drinks urns which was different to normal and while we waited for the service we chatted to the soldiers before some of them were hastily sent to get more chairs and then we all found a seat and the colours were brought on, then Chaplain Wendy Hough conducted a short but very nice service, a recording was played of the Last Post then the silence followed by the Reveille. After the service everyone spread out to visit the graves and some went over to the tent and had refreshments and while this was all going on I sat down with Rev’d Wendy and had a nice conversation with her about my army life which led to Margaret and Chris being mentioned and she said she had got to know them well. People were now drifting back to the coach so we climbed aboard and were off as far as the border crossing which was another long wait and then finally we were on our way back to the Pia Bella. Terry and I returned to our hotel to freshen up and then caught the Dolmus to the car park and walked down to the taxi rank at the Dome Hotel. We looked for the taxi we used after our walk around the Castle, and enquired with one of the drivers and as soon as I mentioned my lost camera he excitedly said wait two minutes and made a call on his mobile and then pointed to the road coming down past the Dome, a cab arrived and the driver I had spoken to before still very excited rushed to it and pointing to me and said to the driver ‘camera’ and with a smile he opened his glove box and produced my camera I thanked him very much and from there we went round to the harbour to tell the good news to the boys at the Chimera. On our way back through the town, having now got my camera back I took some photos of the fountain opposite the main car park. That evening we returned to the Blue Rose for our evening meal, the other party was already having a drink after their meal at their hotel, this time I asked Lynn about some of the meals on their menu I had never heard of and she explained to me what they consisted of and one was a speciality that her business partner conjured up so I agreed to try it and when it was served up to me it was in an earthenware dish bubbling hot, as it cooled I started eating it and it was different to what I was used to but I thoroughly enjoyed it and because Lynn had prompted me to have it she came to the table twice to ask me if it was okay and then her partner came out all grins asking me if I enjoyed it, I wish I could remember his name because on all our visits there he was never any different, just a big happy smile. Tuesday we decided to have a quiet day just amusing ourselves around Kyrenia so it was the usual ride and walk down to the harbour moving through the mayhem of traffic, then we took a perilous walk along the sea wall, perilous because the wind was quite strong and the waves from the choppy swell were coming over the wall and we didn’t fancy getting drenched. There were a lot of youngsters enjoying themselves by taking a chance and running along where the last wave had erupted and they were lucky a couple of times then finally they all got drenched. We made our way back into the hubbub of the harbour with its many restaurants and bars and negotiated our way to the Chimera where we settled for a coffee. As we sat there a convoy of military motor cyclists, heavily armoured land rovers and scout cars came from the Castle end and after they had passed we began walking back round the harbour where we suddenly became aware of crowds of people and as we proceeded further the vehicles were lined up along the road close to Ataturk Square and some children were having a wonderful time climbing on them. 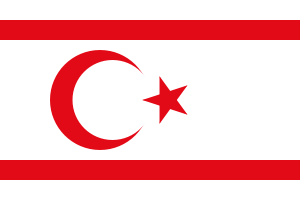 We understand that this was the anniversary of the Declaration of Independence of the Turkish Republic of Northern Cyprus – 15th November 1983. There were now two units of soldiers parading, one group in battledress type of uniform and the others in ceremonial dress and they were then joined by a band and all this action was now bringing more people to view the event as many groups of young people marched past followed by a land rover holding three men, one in naval uniform saluting, who must have been dignitaries of some sort, and they disappeared from view then returned still standing stiffly to attention and dismounted from their vehicle and walked onto Ataturk Square. Speeches began so we made our exit to find that the road had been closed so we walked up to the car park to get a taxi back to our hotel to pack our cases for the exchange of hotels the next day. We visited the Blue Rose again for our evening meal where I tried another different meal, after which we went over to the Pia Bella to listen to the Gypsy Brothers, a musical duo, who are there regularly and are very good and then we returned to our hotel to finish packing, this was our last night at Sammy’s and our hire car was being delivered at 09.00 the next morning. Up for breakfast then Terry went down to reception where a very nice young lady handed over the keys for our car and after the necessary paperwork was completed we thanked our little waiter for the service he had given us during our stay at Sammy’s Hotel and wished him all the best because he was going home to Pakistan to get married. 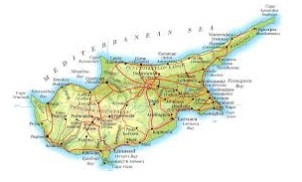 To be continued with some nostalgic trips to some of the places we remembered from those early years in Cyprus ……. 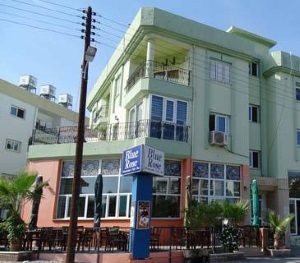 This entry was posted in British friends, Friends Pages, Information and tagged Blue Rose Restaurant Kyrenia, Chimera Restaurant Kyrenia, North Cyprus, Pia Bella Hotel Girne, Sammy's Hotel Kyrenia, Suffolk Regiment in Cyprus, The Old British Cemetery Kyrenia, TRNC, Wayne's Keep Cemetery. Bookmark the permalink.